When my husband and I married in late 2002, one of the things we agreed on was that we wanted to start a family. We both desired lots of children, and were anxious to get things underway! Unfortunately, our path to parenthood was not destined to be smooth. After trying on our own to conceive for over 3 years, I finally went to see my ob-gyn. He eventually referred me to a reproductive endocrinologist (RE) for a consultation, but it was 2 more years before we got around to it. I was young (still just 25) and not too worried yet. After several months of testing, we were diagnosed with multiple fertility problems. Our doctors were hopeful though that we would eventually have children, just with a little assistance! We started treatments in December of 2007. After four unsuccessful IUI’s (two with Clomid and 2 with injectables), we decided to move onto IVF. It took some time, but in December of 2009 we had our first transfer. Just a few days shy of Christmas, I finally saw something I had begun to think I would never see: two pink lines on a pregnancy test! My husband was so excited that he posted it to Facebook that day. I was nervous, but excited as well, and thought that my turn had finally come. A little over a week later, I started spotting. The doctor assured me that was normal, but scheduled a routine ultrasound anyway. At just over 5 weeks, I got to see my little baby! There was also a second, much smaller, sac and the doctor surmised that we quite possibly were losing a twin, which would explain the bleeding. Things got progressively worse, though, and I was told to remain at home and off my feet. The days dragged by. On January 7th, 2010, I layed in bed with what felt like contractions and gushing blood. I knew then that my pregnancy was over. Sure enough, an ultrasound the next day confirmed the worst. My first miscarriage was like a sucker-punch in the gut. We had been hoping, dreaming, for so long and to have it snatched away so quickly seemed so unfair. I was determined to keep trying, though, and tried to remain positive. After all, we’d gotten pregnant once. Surely we could do it again! In April, we decided to transfer our remaining frozen blastocysts. I waited anxiously for the next few weeks, praying that it would work a second time. Just a few days after my 29th birthday, I got confirmation. We were expecting again! This time, things went better. There was no early spotting and when I cleared the six-week mark I breathed a huge sigh of relief. Our first ultrasound a few days later revealed a growing baby, with a beating heart! My husband and I sat there listening to that thumpa-thumpa-thumpa and just bawled. Two weeks later, we got another ultrasound (still growing, still a heartbeat) and were officially released from the RE to a “regular” OB. I was so excited, and started to feel like this would actually happen. I made plans for the nursery and started talking about names. I was sicker than sick, though I relished every time I would throw up. This was SO worth it, I kept telling myself. At 10.5 weeks, we had our first OB appointment. It was new territory for us, having grown accustomed to the specialists office, though never making it this far. Our OB was wonderful and supportive and understanding about my fears of another loss. He promised me another ultrasound so that we could get another look at our little one. When he first pulled out the Doppler, he couldn’t find the heartbeat. He didn’t seem concerned, however, as it was still so early. He ushered us back for the ultrasound. The tech dimmed the lights and I was in for another new experience: an abdominal ultrasound! She had a hard time locating the baby, though, and decided we’d have to do a vaginal one. I felt all the air in the room just woosh out. So that was it. Another baby, gone. I didn’t cry. I think I was just in shock. My husband kept trying to ask her if she was sure. I knew, deep down inside, that she was. I had choices this time. 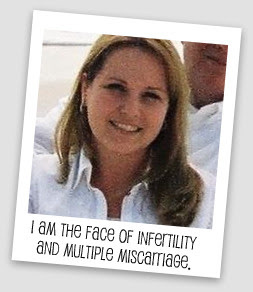 Being further along than the first loss, I was scared to miscarry naturally again. The baby measured just 8 weeks, which meant he/she had been gone for over two weeks by that time, and my body had made no show of passing it on its own. We decided to have a D&C, which we scheduled for the following day. It was the most devastating day of my life so far. Miscarriage is always heartbreaking, but even more so when you’ve tried so long — and gone to such great lengths — to get pregnant in the first place. I never dreamed I’d lose one child, let alone two. We still don’t know why we lost our babies. There’s more testing to be done, and we are hopeful that we will find a cause, and even more hopeful to find a treatment. We’ve overcome so many hurdles in this journey and aren’t ready to give up just yet. There’s still hope, buried there amongst the grief, just waiting to re-emerge. Kellee, thanks for sharing your story. We feel as though we have lived this with you first hand. We're in the wings with you guys…standing in FAITH…that your day to be parents is soon.